Meat Eating Military Man - A food blog with tasty meaty recipes. Salmon is thought to have come from the Latin word salire, which means, “to leap.” In this case, get ready because this salmon recipe will put a spring in your step. This fish is known to jump out of the water when it swimming upstream. First, let’s get something out of the way. It is a beautiful fish. But, salmon can also be a little strange. It starts off a freshwater fish and then journeys to the ocean. Then it goes back into freshwater when it is old enough to reproduce. 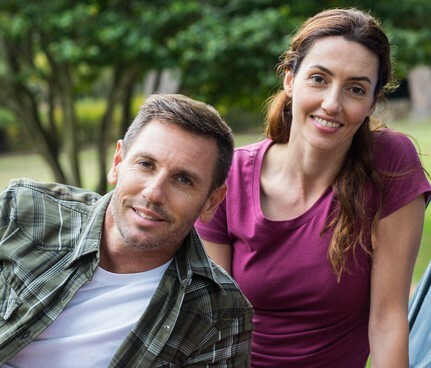 Depending on when you get it, you can either be eating saltwater or freshwater fish. Another thing about the salmon is that even though it is everywhere, it still feels fancy. Go to a restaurant in a fancy place, and you can see it. Visit a neighborhood joint, open the menu, and there it is. It is common, but it still feels like a special occasion meal. And finally, why does salmon from a restaurant always taste better than when you cook it at home? Do you see where I’m going? As I said, this little creature is a strange fish. I don’t know much about the salmon’s habitat preferences, but I can unravel some of the mystery on the last two. Salmon is the favorite of chefs because it is readily available. Commercial farming methods have made it easy to respond to demand. Also, it is a healthy choice of protein. Salmon is high in Omega-3 fatty acids and vitamin D.
Salmon is also a favorite because it is very delicious. Imagine digging into a perfectly-cooked slab of salmon. Think of the forkfuls of meat melting into your mouth. Salmon also has a distinct, delicious taste. You can also recreate – or even beat! – the salmon served at restaurants by following these quick and easy steps. First, take some salmon. You can either go for salmon steaks or salmon fillets. Just make sure that they are of good quality. It should smell fishy, but not rotten. The meat should have a slight spring when you press at it. Prepare about 1 ½ lbs. Prepare your marinade. Prepare two tablespoons of lemon juice. Fun fact: an average-sized lemon gives about three tablespoons of lemon juice. Go ahead and pick a smaller lemon for this recipe. Mince three cloves of garlic. It might seem like a lot but trust me with this. The garlic will complement the rest of the ingredients. Also, cooking the fish on the grill will mellow out the garlic flavor. Now on to the seasonings. Combine a teaspoon of salt, one teaspoon of pepper, and three Cajun seasoning. Mix all your marinade ingredients with three tablespoons of olive oil. When the ingredients are well-blended, pour your marinade mixture over the salmon. Let it sit for about an hour. If it is a hot day, go ahead and put it in the fridge to marinade. This will prevent your fish from going bad from being under the sun for too long. Easy, right? So far, we haven’t done anything that is too intimidating. Now we move on to the next stage. Here comes the part where a lot of people have some trouble. Pay attention, folks, because this is what will spell the difference between a tender, flaky fish and a bone-dry one. You will now grill the salmon. Grilling is one of the best ways to cook salmon because it brings out a smoky flavor that complements the flavor of the fish. Start by placing the salmon on a preheated grill, skin-side down. Preheat your grill to medium-high heat. The quick blast of heat is what will give your salmon those professional-looking grill marks. You can place your fish diagonally against the grill. The grill marks will cut across the fish diagonally too so it will look like a professional did it. CHEF TIP: If you are cooking salmon with skin, it is essential that you place the skin side down. Salmon cooks quickly. Placing the skin first get it to crisp up without overcooking the fish. Don’t worry about the fish sticking to the grill. You can prevent this by placing vegetable oil on a paper towel. Use tongs to grease the grill generously. Also, if you properly crisp the skin of the fish, it won’t stick. On average, it will take about three to four minutes of grilling on each side. But please take note, that this is just the average! Keep an eye out on your fish. The meat turns opaque when done. The fish should flake with a fork. Now all you have to do is to plate it up. Salmon can be served in different ways. You can try rice or some vegetables that you can also cook on the grill. Don’t forget to serve it with a wedge of lemon. The hit of acidity right before you take the first bite will elevate the flavors. 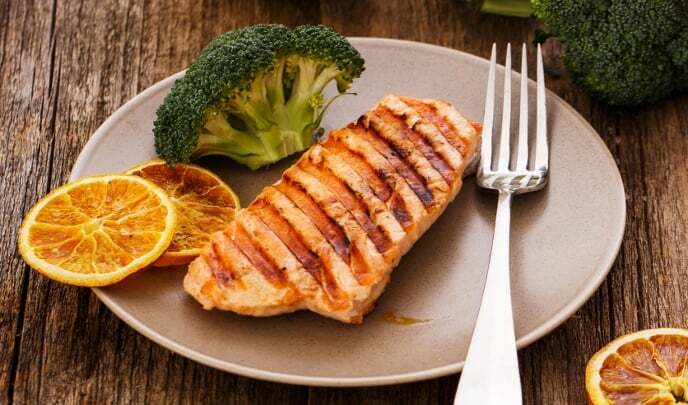 Easy and delicious grilled salmon recipe. Preheat your grill to medium-high heat. Mix all the marinade ingredients until well-blended. Place your fish into the marinade. Coat all the sides with the marinade for an hour. Grill the salmon for 3 to 4 minutes on each side, or until the meat is flaky. 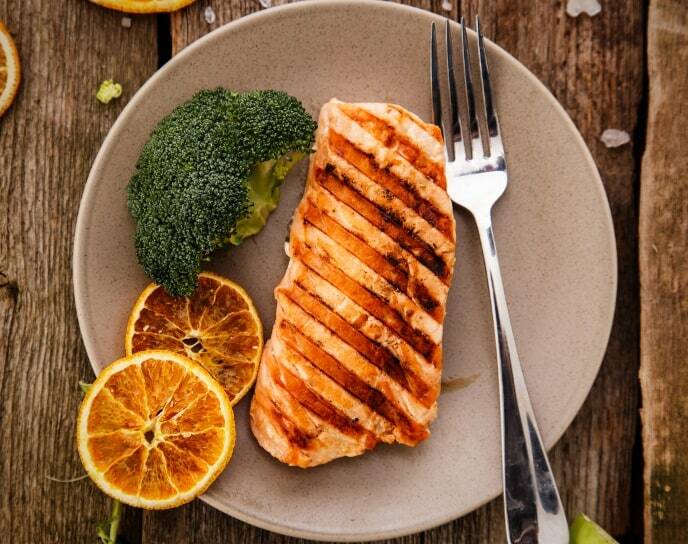 How many calories in a grilled salmon? Calories depend on the size of the fish. One serving size of a salmon fillet is approximately 6 oz. It has about 367 calories. Ideas on what to serve with grilled salmon? Salmon has a mild flavor so it can pair well with a variety of dishes. Try roasted vegetables or some couscous. Is it okay to grill salmon with skin? Yes, it is. You can also grill with the skin off. But salmon skin is delicious when cooked until crispy. It will also be easier to remove the fish from the grill if the skin is there to hold it together. What should be the internal temperature of grilled salmon? 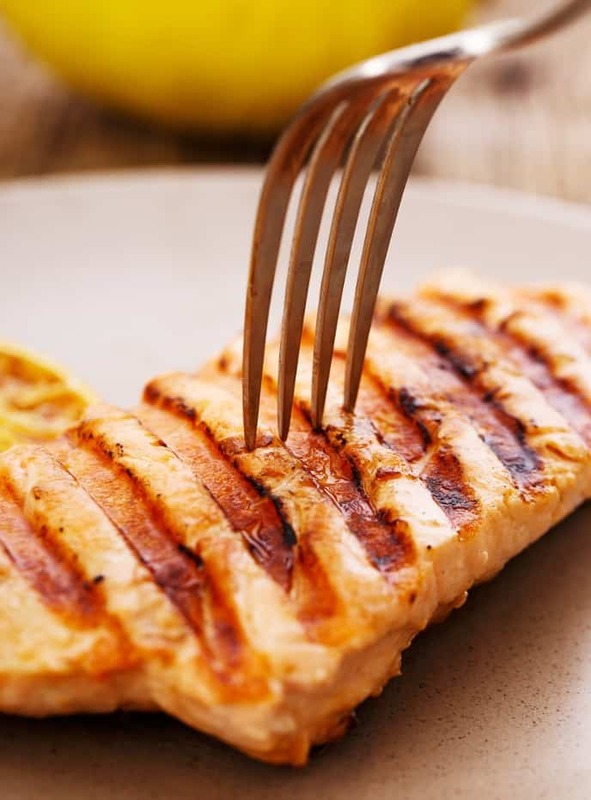 The inside temperature of grilled salmon should be 145 degrees Fahrenheit at its thickest part. Alternative spices for grilled salmon I can use? You can experiment with your flavors. Try thyme or tarragon. Pesto on salmon also sounds good. You can also switch up your acidity profile. Instead of lemon, you can also use lime.